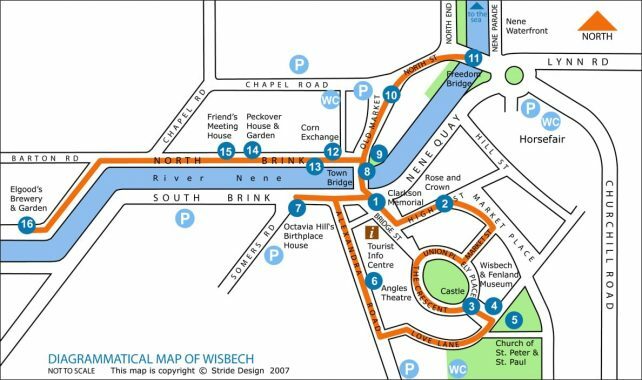 A Merchants’ Trail for Wisbech was developed a number of years ago designed to guide people by way of a downloaded podcast and map of Wisbech exploring the history of the Town and identifying key areas of interest. The brass plaques in the ground can still be seen in a number of locations which correspond to “stops” on the trail. With the support from a group of project volunteers including representatives from the Wisbech Society, Street Pride, WISARD and Town Council, The High Street Project is updating the existing Merchants’ Trail, refreshing the information on some of the locations, creating a new map and adding new elements to include the High Street to bring it up to date. We will also be including a new “stop” on the trail at the Wisbech General Cemetery which is also receiving a grant from HLF to renovate the chapel. Students from the College of West Anglia are re-taking the photographs to accompany the updated map. As part of their Work Experience this gives them an opportunity to work to a real client brief. We are currently looking for a new “voice” to update the audio guide. Read a blog from one of the project volunteers Dr Eric Somerville to find out how the update is progressing. If you are interested in becoming involved or woud like to audition for the “voice” get in touch! Having lived in Wisbech for only two years I will find this trail very interesting. There are many fine buildings in this town and it would be most interesting to find out their history and the history of other parts of the town. Look forward to the publication.